In aid of The Priory Heritage Project. Cantores Salicium is pleased to present a programme inspired by the beautiful east wall painting in the Priory. 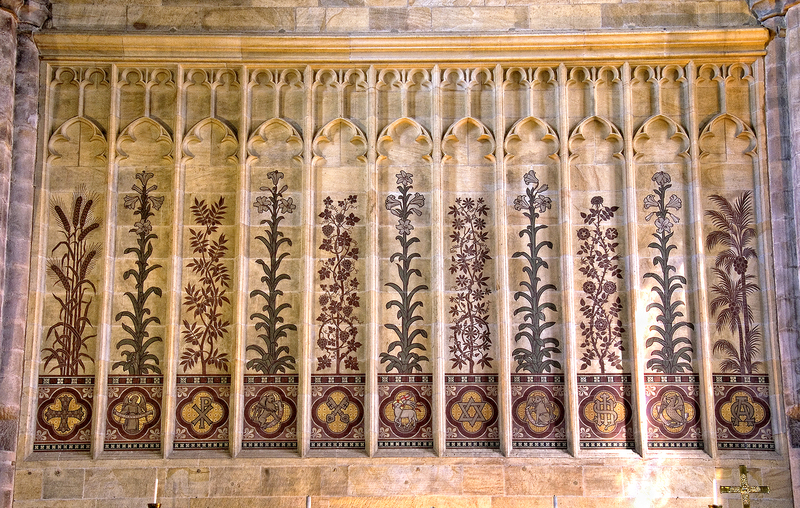 Each of the plants depicted represents a biblical symbol: barley and vines for the sacraments, roses and passion flowers for the crucifixion, palms for the triumphant entry into Jerusalem and also the triumph of the risen Christ, and Madonna lilies for the Virgin Mary. There are numerous musical settings of the biblical descriptions of these plants, and in this programme the audience will be treated to choral works ranging from the Renaissance to the twentieth century. The predominance of the Madonna lily amongst the images is seen in three works, Guerrero’s Ave virgo sanctissima (Hail most holy virgin), Brumels’ Sicut lilium (as the lily amongst thorns) and Peter Philips’ Salve regina (Hail holy queen), these being interspersed amongst the other plants as they are in the painting. Barley is represented first by Byrd’s Ego sum panis vivos (I am the true bread) and later by Mozart’s haunting Ave verum corpus . Poulenc’s Vinea mea electa (My chosen vine) is a motet for Good Friday in which we hear the unequivocal call to release Barrabas and Tchaikovsky’s ‘Crown of Thorns’, sung in Russian, foretells the crucifixion. The first half ends with Philips’ Surgens Jesus (The risen Jesus). It seemed appropriate to include a setting of the mass and the concert ends with Haydn’s delightfully sunny St Nicolas Mass, with soloists from the choir. We are delighted that our organist will be Timothy Raymond.